A commercial example – Intel SSDs make ordering burgers easier! Traditionally, discussions about Solid State Drives (SSDs) have revolved around comparisons with old mechanical disks and how much slower they are. But SSD technology has matured to the point where SSDs are no longer created equal. Now, the performance and reliability of different models, at both consumer and business levels, varies dramatically due to differences regarding internal components and the connectors used to attach them – whether that’s to home computers, workstations or servers in data centers. Old hard disks literally store data (magnetically) on spinning disks which is read by a ‘ligature’ arm that’s moves a bit like a frantic, old record player. Delays in ‘spinning up’ mean there’s a delay in accessing information and subsequent searching for the information takes some time. On top of this spinning creates heat which then requires cooling – this is particularly expensive at a data center level - and also can result in a higher number of drive failure rates. Furthermore, their connections to computers and servers are relatively slow – like a one lane highway – and as such, hard disks have always been the greatest bottlenecks to computers’ and servers’ performance. It’s far more efficient to store data on microchips instead. SSDs require less power, run cooler and you don’t need to wait for them to ‘spin up’ so response time is faster too. Over recent years, reliability and circuitry has improved dramatically while the cost has fallen. But while speed has increased in the disks themselves, connections to the computer have still been the biggest bottleneck. This is all now changing in a very big way. For years, the main way to connect a disk to a computer has been using a SATA cable while servers use ‘SAS’ connectors. But even these provide bottlenecks. SSD technology is capable of much more. The industry has known about this for a long time and companies like Intel have developed a new connection technology called Non-Volatile Memory Express or NVMe. The standard introduces many evolutionary improvements in efficiency along with some sledgehammer revolutionary improvements. The first is the ability to process more than one data queue: this has increased from one in SATA-connected devices to 65,536! While there are some benefits in home computing, the biggest beneficiary is the datacenter, where individual servers are processing high numbers of simultaneous data requests. Massive data speed boosts are created by moving data onto the super-fast, multi-lane PCI Express (PCIe) Bus – in laymen’s terms, the place where you plug in your graphics cards. But how do you physically connect an NVMe drive to it? In recent years, some companies have created innovative workarounds to getting SSD storage drives onto the faster PCIe bus. Some have used existing connection technologies and protocols to plug storage cards into PCIe slots like graphics cards. Others have used mSATA (still common in laptops) to plug small storage chips into the motherboard using standard SATA technology. The latter has since evolved into an M.2 connection which allowsmore storage chips to be plugged directly into the motherboard using the faster PCIeconnection technology. But these connections all represent interim technology and come with limitations. While you can already plug existing NVMe drives into regular computers and servers using adapters (which come with a performance hit), native NVMe connections will soon be what you see everywhere. Newer servers already have the new connectors which are known as U.2 ports and the consumer market is catching up. With some manufacturers already launching motherboards with U.2 connectors, consumers will increasingly have the choice between using SSDs on add-in cards or 2.5-inch/U.2 form factors, like those in Intel’s 750 SSD series. If you just want to speed up your existing PC at home, whether it’s for gaming or basic graphics and video work, most people are best off buying consumer-level SSDs like Intel’s 535 and 540s series, which are built using SATA technology. These disks will easily plug into any existing computer and give you a noticeable speed boost whether you’re booting up, waiting for a game level to load faster, or just doing some work. Their cost is affordable, performance is high and importantly, having a brand like Intel with its 5-year warranty across the SSD range, provides extra peace of mind. If you use one in a laptop, the difference can be more significant. Less power consumption means longer battery life. The speed boost is even more noticeable because laptop mechanical hard disks are slower than desktop versions. They emit less heat which means less discomfort and less cooling and they’re more robust if dropped due to the lack of spinning disks inside. If disaster does strike, retrieving valuable information from an SSD is much easier than retrieving it from a mechanical disk. Intel partnered with digital signage company, Coates Digital to bring touch-screen food ordering to McDonalds. The burger giant’s popular Create Your Taste system is powered by 12,000 Intel NUCs featuring Intel SSDs across 1000 stores in Australia and New Zealand. The high performance of the SSDs help ensure an instant response for customers while their lack of heat generation means consoles can be made smaller and not require extra cooling. In an environment where failure and expensive tech support is not an option, and where customers are in control, only brands which can be relied upon to “just work” and not break down are chosen. With the NVMe drive communicating with a computer’s processor and memory so much quicker (along the PCI Express bus), there are no longer any bottlenecks in the system. 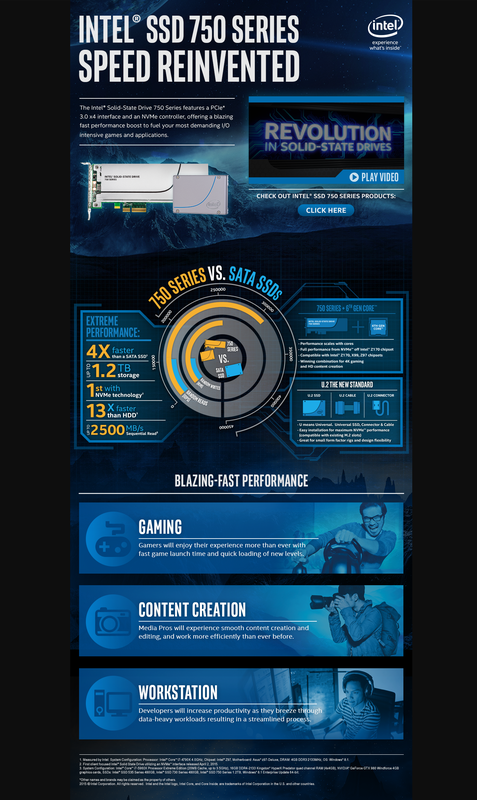 This is incredibly attractive to high-end computer and workstation users who use demanding applications like video editing and gamers who demand the best performance a computer can offer. Suddenly, real-time editing with more-than-one Ultra HD 4K video file is possible. And, if you’re fed up with spawning into games after the rest of your team has already run off, now you’ll be first on the map. You’ll be hard pressed to find any application which doesn’t operate near-instantaneously, even in today’s data-hungry environment. Intel 750 drives come in both 2.5-inch/U.2 form factors and as a PCI-Express card. Drivers are already built into the latest Windows versions but you’ll need to make sure you motherboard’s BIOS is compatible with NVMe if you want to boot from one. If your computer can’t boot from a 750 you can still use it as a fast, secondary-storage drive: just note that few consumer motherboards have a U.2 slot to plug the 2.5-inch drive into so you’ll likely have to use an M.2 slot and an M.2-to-U.2 adapter if you buy one. For data center SSD options, SATA or NVMe are the main choices. 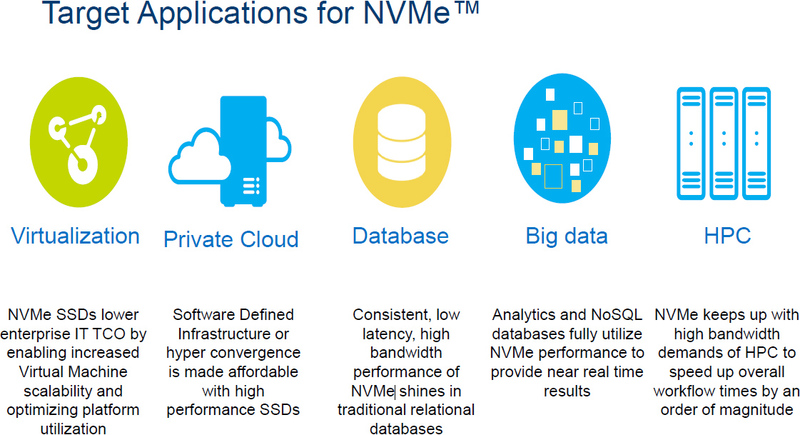 The performance bottleneck removed by NVMe drives is just one benefit to the datacentre. Processing over 65,000 data queues at once is another. But there are other major benefits too, including data throughput. For example, when looking at SATA-driven Intel S3710 series Data Center SSDs vs NVMe-driven Intel P3700 Series Data Center SSDs – there is up to 5x improvement in data-transfer speeds. While the SATA-driven SSD tops out at 550 MB/s sequential read, NVMe can reach up to 2800 MB/s sequential read throughput on a PCIe 3.0 x4 slot. This acceleration can generate a 9x improvement in data transfer speeds with up to 5000MB/s sequential read on a PCIe 3.0 x8 connected drive when looking at the top-of-the-line Intel P3608 Data Center SSD v Intel S3710 series Data Center SSD*. Intel’s Data Center series of SSDs are optimized for the data center and offer features that don’t appear on consumer drives. Intel Data Center drives are designed to carry larger and more-complex workloads that run 100% of the time – 24 hours a day, seven days a week. Because of this, the NAND technology is built to take higher endurance levels associated with datacenter workloads and usage, which you don’t typically see in a personal computer. They also come with ‘E2E’ error checking for improved reliability and have a nifty power loss feature which will detect an imminent power failure and finish final tasks before powering off – like a mini built-in backup battery. No matter what task is thrown at them they’ll do it fast and reliably. Adding a fast, reliable SSD has never been more cost effective and is the best way to add a significant performance boost to an existing computer – especially laptops. But early adopters can get an even faster performance boost with NVMe drives just by putting some thought into how they’ll connect one to their high-end computer or workstation. Soon dedicated NVMe connectors will be ubiquitous and this performance boost will be readily-available to everyone. But in the world of datacenters the purchase decision is a no-brainer. One NVMe-connected server can do the work of four others and far more efficiently too. Finally, we’re past the point of commoditized SSDs and where choosing a new one requires some thought. Price and capacity are no longer the first considerations to be made when buying: brand, features, reliability and bottleneck-removing NVMe technology are now key factors. Whatever your storage requirements are, now is the time to buy into the new generation of SSDs.